Are you going on a long awaited vacation to Sydney Australia? Do you need some of your currency exchanged. There are lots of great ways to get your money exchanged within this warm city. But wait. There are also a few ways that you should not even think of when exchanging your currency. For example, when you are exchanging money within Australia try to avoid population filled areas like a shopping centre or even at a terminal. This is because these population filled areas are full of tourists of the country and this means that the rates will be incredibly bad and there will usually be some sort of fee that you will have to pay. In this blog post, we will be sure to tell you whom to go to when you get your currency exchanged so that you get the most competitive rates for your exchange. When you go to get your currency exchanged in this beautiful country depending on which method you are using you may need to bring some items with you. What I mean by this is that there are a handful of different ways and payments in which you can get your currency exchanged in Australia. For example, if you are ordering your Australian currency exchange online so you can pick it up at an Australian post office you must show some sort of photographic identification no matter how much you trade. This is because you must show that it is you that owns that card on the transaction that was made. You can use multiple variations of identification, for example, you can use a citizenship card, Visa or any other type of photographic Identification. This proves that it is you that owns the card in which the transaction of the currency exchange took place. It is important to note that if you are paying with any type of cash to exchange currency, you will not need to show any identification of any kind as no cards are involved. The bottom line is that if you are using a card for payment no matter how small the exchange is, always be ready to show proof that it is you that owns the card. You are finally ready to exchange currency in Sydney. However, you do not know where to go for the transaction. Well, there is a whole range of different options, but in my opinion, the best choice is an Australian bank. I have chosen this as the best option for exchanging currency in Australia as banks will be more than easy to find as they are very popular, and the transactions take place by trained employees. By going to an Aussie bank, you are sure to a great rate change experience compared to other institutions, and there is only a fee of a few percent for the overall exchange. It is evident that banks are very common in Australia and are basically found on any street in Sydney, however, because of new technology you can now see how close you are to an Australian bank. You are now able to use a GPS digital app on your phone to help you find that bank’s nearest branch. You may be thinking to yourself that there are no branches of your bank near you. However, there is no need to panic as the next best choice is by far a post office. A post office in Australia is an excellent choice to exchange your currency as this is because you will not have to pay any fee at all for trading any type of currency. There, however, is a small issue with going to a post office for an exchange of some types of currency. For example, sometimes you will have to phone or even sometimes e-mail the post office that you are looking to visit in advance of visiting them. This is to make sure that they have that currency available so you can exchange it. The phone number is easy to find as all you have to do is look it up online or if you want you can always use a phonebook. This means that if your currency or the currency you want is not available, you will have to roughly wait two or three days for the transaction to take place. Those two options have always been the traditional approach for exchanging currency in the sunny Australia. However, now that technology and society have continued to evolve there are now other options that you can choose from for exchanging your currency. An example of this would be a company called World First. This company is great as you can open an account with the website and it will be up and running within one hour. In short, that means that you can exchange currency within one hour. This is a great option, but you must also take into consideration that there is also a fee that comes with trading with World First. However, the good news is you are actually able to negotiate a rate with this company, and the rate is negotiated by if you are looking to do business with the enterprise in the future. You have now heard me talk about the three best places to go to in Australia for currency exchange. However, you are probably now wondering where to find these buildings location wise. Well, what if I told you that there is a bank very close beside Sydney Airport. You may be thinking to yourself that you can just use a bank at an airport, but remember airports are famous for horrendous rates, so it is best to avoid anything currency exchange related at an airport. However, the good news is that just a few miles away from the airport there is a proper Aussie bank that won’t take advantage of you. The address of this Aussie bank is,” 687 – 689 Botany Rd, Beaconsfield NSW 2015, Australia.” This is a Commonwealth Bank, and by it being close to the Sydney International Airport it will be very convenient for you to get your currency exchanged at attractive rates. Now, you a probably wondering to yourself where the closest post office is to the airport. There is a post office in the actual airport itself but remember to avoid anything currency exchange related to the airport or else you will be ripped off. Well, let me be the first to tell you that there is a post office that is only a few miles away from the Sydney International Airport. The address to the post office is, “972 Botany Rd, Mascot NSW 2020, Australia.” By it only being a few minutes away from the Sydney Airport it means you can quickly exchange your currency with better rates and you avoid being ripped off at a tourist-heavy location like an airport. If you are going straight to the Sydney city centre, you can go to a World First institution for a great currency exchange experience. The location of this World First building in Australia is, “5/261 George St, Sydney NSW 2000, Australia.” This is a great place as if you are spending your day shopping in Sydney you can just walk into the centre of the city and get your currency exchanged without having to take a whole road trip across Sydney to find the closest World First building. My conclusion to this post is that in Australia there are both good and bad ways for you to get your currency exchanged. The main point here is that it is best to avoid heavy tourist areas in Australia like a train station or even an airport as they are known to have incredibly lousy rates to take advantage of tourists. 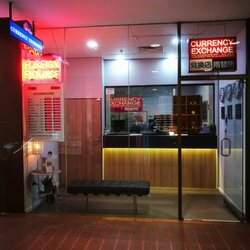 You are best to go to the three locations I have mentioned above to ensure you get the best rates possible for your currency exchange experience in the beautiful Australia.